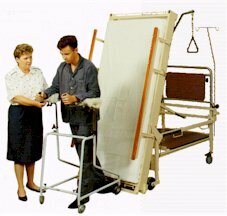 Special Care Hospital Beds - "Oldsway"
The OLDSway Tilting Bed is a new concept in patient care, rehabilitation and mobilisation. 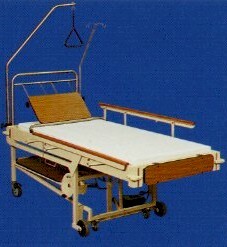 Designed to give maximum patient safety, comfort and confidence with minimum physical effort for nursing staff. 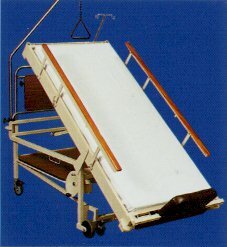 The foot operated hydraulic unit gently tilts the bed platform to an upright position, allowing easy mobilisation. Tilting can be gradual and held at any angle to suit the patients condition and recovery. A hand operated crank provides foot elevation to 5 degrees. Comfort and confidence combine with proven safety benefits for both health carers and patients during rehabilitation and mobilisation. � Adjustable head assembly, removable. � Medi-Flextra water proof mattress. positionable at any corner of the bed. � Two restraint straps with fixtures. foot with additional castors to enable easy manoeuvring. � Large accessory shelf with high clearance under bed. � Attractively finished fold down safety sides.